Backflow Prevention is a serious Health issue. This device is required to be operational on all automatic sprinkler systems -- It's what prevent our drinking water from being contaminated! It isn't "just" the shut-off valve to your sprinkler water source. A physical connection between drinkable water and a liquid or gas that could make the water unsafe to drink. Wherever there is a cross-connection, there is a potential threat to public health from the liquid or gas contaminants. supply lines or an increase in pressure on the customer’s side. • Garden hose: Backflow through cross-connections can occur at your home if you leave a garden hose turned on and submerged in a swimming pool, or insert it into your car’s radiator to flush out the antifreeze, or attach it to an insecticide sprayer. That material could siphon back into your drinkable water. • Private well: Backflow can also occur if a pump supplied from an untreated water supply, such as a private well, were connected to the drinkable water supply. The untreated water could be pumped into the drinkable water supply which serves your home and the public water system. could be drawn into the drinkable water supply for your home. Backflow into a potable-water system can be prevented using an assembly approved by the water supplier, or a physical separation between the water supply and a potential source of pollution. 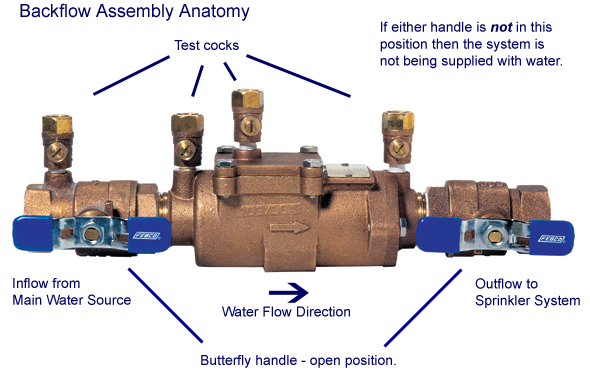 The water supplier determines the type of backflow-prevention assembly required, based on the existing or potential degree of hazard. The TCEQ requires testing of all backflow prevention assemblies at time of installation, by a TCEQ licensed tester. Backflow-prevention assemblies installed to protect against health hazards must be tested annually. For more information about backflow and cross connection control, visit www.tceq.state.tx.us/goto/cc .